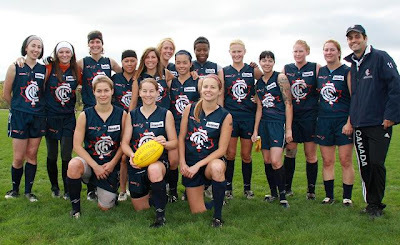 The year for Aussie Rules in Quebec ended on yet another high as two Montreal Angels earned their wings and secured spots on the Canadian National team. After a fantastic effort at the U.S Club Nationals in Mason, Ohio Margo Legault and little sister Aimee Legault were both named to the Northern Lights squad. Three Montreal Angels competed this weekend at the U.S Nationals, North America's biggest Aussie Rules tournament that was held in Mason, Ohio. 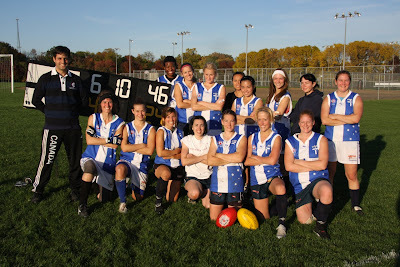 Part of a three city team, the Angels were teamed with the Toronto Blues women's team and Sacramento Ladies Aussie Rules team. Margo Legault, Lindsay Belzie and Aimee Legault all first year players were thrown into the deep end against teams that have been playing for years and all did exceptionally well. The Eastern Canada/Sacramento team losing their first game to one of the tournament favourites Calgary, then lost a hard fought match against Arizona in which they outscored the American team in the second half. The icing on the cake was a hard defensive victory in game 3 over the New York Magpies, an amazing effort from the team.